Tobacco was an important crop grown in Virginia and the other southern colonies before the American Revolution and was essential to the economy during colonial times. In this video, two young visitors learn about growing tobacco, why it was called a cash crop, how the farmer exchanged his tobacco for a note rather than cash and how farming changed during and after the war. Teachers and parents, check out this classroom instruction unit that will bring colonial economics to life for your students! 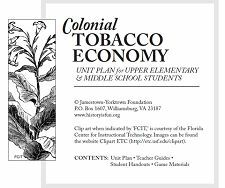 Learners will explore the 18th-century tobacco economy as they watch a short video and engage in vocabulary, graphing and historical analysis activities. Students can test their success as a colonial farmer in the culminating board game activity. A teacher lesson plan, background reading and activity answer keys are included in the unit. Get ready to amaze your students at how fun economics can be!